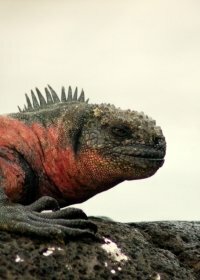 This unique tour explores both the mainland of Ecuador and the Galapagos Islands in search of some of the countries wonderful reptile and amphibian species. 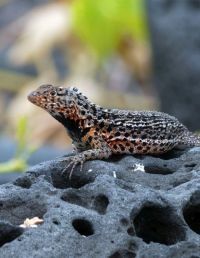 During this specialist herpetological photography tour you will be in expert hands of our expert wildlife biologists and award-winning wildlife photographers. 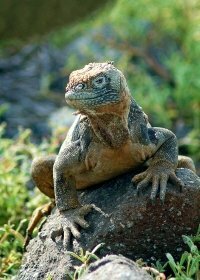 After visiting the cloud forests and Amazon on the Ecuadorian mainland and hopefully finding and photographing at least 100 different species of reptiles and amphibians you will have an immersive and action-packed seven-day adventure on the storied and breathtaking Galapagos Islands. Today you will be met at Quito airport by your local guide and driver and begin your drive out of town and westwards towards the town of Mindo, Mindo is a bioregion of the Choco or Andean cloud forest. The drive will take you out of Quito valley and onto the western slopes of the Andes and into the diverse and incredible cloud forests. After around 2 hours you will arrive at the lodge and then after settling in you will be taken to try and find your first species of the trip. There are many areas around Mindo cloud forest which can be explored and you will be taken to the best places for the targeted species tonight. 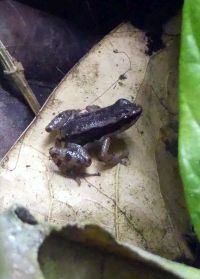 The locations vary from sightings to sightings and tonight you will be mostly looking for glassfrogs, rainfrogs and anoles. 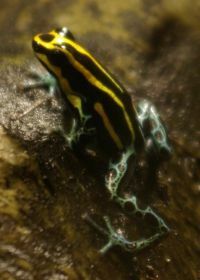 his region houses the greatest number of glassfrog species in the world, and the second greatest number of rainfrogs. 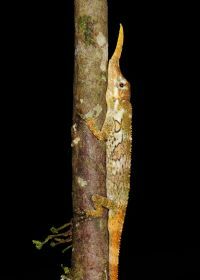 There are good chances to photograph the elusive Pinocchio Anole (Anolis proboscis), the Ornate Rainfrog (Pristimantis ornatissimus) and the Mutable Rainfrog (Pristimantis mutabilis). 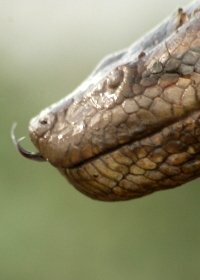 Vipers are rare, but beautiful and, most of them, cloudforest endemics so we will keep an eye open for these too. The Pinocchio anole is one of the most incredible species of lizard in the world with an enormous nose horn, the ornate rainfrog is a stunningly patterned frog and the mutable rainfrog is recently described and is to date the only known amphibian to rapidly change its body shape and skin texture in response to the need to be camouflaged. Tonight is just a quick stop over in Mindo as you will be travelling further on tomorrow, but you will be back in Mindo later in the trip so rest assured that if any of the targeted species allude you tonight you will have other chances to see them later. This morning after breakfast we will leave Mindo and travel another 3-4 hours further north-west along the western slopes of the Andes. Your destination today will be the Canande Reserve; this reserve is located in the rich and diverse Choco habitat. The reserve itself protects a fragment of lowland rainforest which is under threat from fragmentation by intensive agriculture (such as oil palm plantations) and timber extraction. The reserve is home to endangered mammals such as jaguars, howler, spider and capuchin monkeys as well as Baird’s tapirs and around 30 near threatened or restricted range species of birds including the globally threatened plumbeous forest-falcon, great-green macaw, ochraceous attila, long-wattled umbrellabird, scarlet-breasted dacnis and grey-backed hawk; but of course it will be some of the diverse reptiles and amphibians in the reserve that we will be looking for today. This afternoon you will have the chance to walk around some of the reserve and then after dark you would be looking for species of vipers, treefrogs and glassfrogs. Today will be a shorter version of what you will be doing for the next two full days. You will have your meals at the lodge or packed lunches in the field, depending on where you are heading and what the day to day situation dictates. For the next four full days you will further explore the world’s second most diverse region on the planet, the Choco. 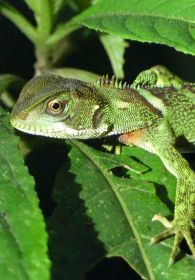 From the moment you set foot in the forest, anoles, geckos, treefrogs and snakes will greet you. 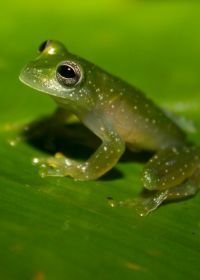 Chances of seeing the famous gold-nugget treefrog (Hypsiboas picturatus), little-devil poison-frog (Oophaga sylvatica), northern eyelash-boa (Trachyboa boulengeri) and eyelash palm-pitviper (Bothriechis schlegelii) are high. These species are some of the most colourful and unusual in the region and our high priority. The stunningly coloured and striking looking eyelash palm-pitviper is of particular interest as it is one of the most beautiful snakes in the world, begin very venomous and very small they are often disliked or overlooked and so only with the help of the expert guides do you have a good chance of seeing one. 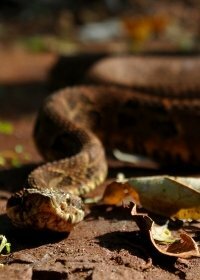 We will have daytime hikes in search of snakes and other species and then enjoy some macrophotography in-situ, then in the night times you will have more hiking looking for the nocturnal species commonly found around here. This morning you will be taken from Canande Reserve in the Choco and transferred back the 3-4 hours to Mindo as with your last time here, today you will spend the evening (after checking in, resting and having dinner) on a nocturnal hike looking for nocturnal herps to photograph. Mindo is a typical cloud forest habitat where the general feel is moist, cool, green and lush. The rainy season is from January until May, with a lot of the precipitation in the form of mist and also rain. Luckily the rain is pretty predictable during this time and starts at about 14:00 daily and continues for a few hours giving us plenty of time to schedule our day activities around this. Because of the higher altitude, Cloud Forests are always cooler than the lowland rainforests. The highest temperatures in Mindo are around 26-27oC and the low at night is around 13oC and this is consistent all year round. Because of the moisture and coolness (that slows evaporation), cloud forests are very green and lush. This unique climate allows loads of epiphytes, plants that live on other plants, to grow almost out of control. There are mosses on the trunks of trees, orchids between the mosses, ferns growing on branches, algae covering leaves, much more so than in rain forests. In Mindo there is a distinct dry season for about 7 months (June through December) when rain is scarce and sporadic, but moisture levels are still maintained by mists that condense on the side of mountains. While mammal species are difficult to see, over time various species have been spotted including, Central American agouti, ocelot, margay, red brocket deer, paca, tayra, Andean coati, three-toed sloth, and white-fronted capuchins. There is also a high diversity of reptiles, amphibians, butterflies and other insects. Today you will enjoy photography during the daytime and focus mostly at night with nocturnal hikes looking for vipers, coralsnakes, dwarf boas, freefrogs and poison-frogs. The wealth of life here is staggering and along with those targeted species you will have the chance to see many other animals. Today you will be taken from Mindo back down into the valley and the capital city of Quito, here you will catch an internal flight and head inland and over the Eastern side of the Andes and down into the mightiest rainforest in the world, the Amazon. On arrival in Coca city you will take a motorised canoe down and deep into Amazon and into Yasuni National Park and onto your accommodation at the wonderful Yasuni Scientific Station. Protected since 1989 and being the ancestral home of the indigenous Huaorani people the vast park is some 9,820km2 and home to still two uncontacted tribes, the Tagaeri and Taromenane. But along with these indigenous people the park is home to a world record number of amphibians (over 150 species), there are also over 120 species of recorded reptiles which means that despite covering just 0.15% of the Amazon by area it is home to over a third of all the herps known from the rainforest. There are also over 380 species of fish, nearly 600 species of birds and over 100 species of mammals; as well as countless invertebrates and over 4,000 species of vascular plants. Today you are likely to arrive too late to explore the park, but you have 4 full days here and will begin your Amazonian adventure tomorrow. The next 4 days will be spent exploring the areas of rainforest around the research station. In the day you will have hikes looking for all manner of reptiles and amphibians including snakes and lizards. 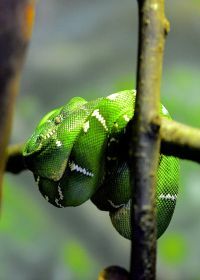 Particularly anoles, boa constrictors and a couple of very popular Amazonian snakes for herpetologists, the two-striped forest-pitviper (Bothriopsis bilineata) and green anaconda (Eunectes murinus). The part of the Amazon we will be exploring is the Upper Amazon and it is widely regarded as the most biodiverse region on the planet. After and during hiking you will have some time for macrophotography which is the best possible way of photographing the smaller reptiles and amphibians here. 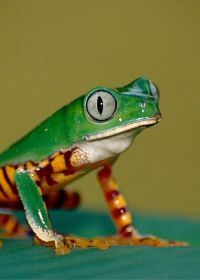 During the night you will have nocturnal hikes where other favourite animals are Amazonian Poison-Frog (Ranitomeya ventrimaculata) and Tiger-striped Monkey-Frog (Phyllomedusa tomopterna). This morning you will have breakfast before beginning your journey back to Coca city via motorised canoe and then you will catch your flight back to Quito. On arrival you will be taken to your accommodation for the night in the city. The rest of the day is free. This morning you will transfer to the airport and catch the flight to Baltra Island (2.5 hours). Once you arrive in the islands, you willcross the Itabaca Channel, which separates Baltra from Santa Cruz Islands and then head straight into the highlands for lunch and a giant tortoise viewing expedition on a private wildlife reserve. 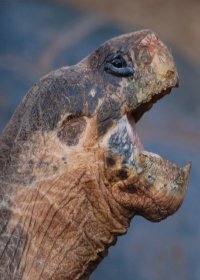 This species is the Western Santa Cruz Giant Tortoise. From here you will check into your accommodation near Pelican Bay. This is also very close the famous Charles Darwin Research Station, and downtown Puerto Ayora. Today is a full day cruise around some of the archipelago. Our destination is North Seymour Island. This tiny speck of land, is home to some of the world’s largest populations of blue-footed boobies and swallow-tailed gulls. Also common on the island are magnificent frigatebirds. As far as herps go this is one of the best places to find land iguanas which were originally translocated to North Seymour from neighboring Baltra Island in the 1930s by the U.S. military. There are also sea lions, marine iguanas and other species that can be seen as we explore this island. During the afternoon, you’ll have the chance to snorkel among hundreds of colorful tropical fish, as well as possible rays, sharks, and green sea turtles. Before returning to Santa Cruz for the night. This morning you will head to the dock to transfer to Isabela Island, a roughly two-hour journey by speedboat. Isabela is the largest island in the archipelago, spanning some 100 kilometers from north to south. It has six shield volcanoes that line the island from north to south. Five of these six volcanoes remain active, making this one of the most volcanically active islands on the planet. After checking into our new hotel you will travel to Las Tintoreras. Here you can snorkel with penguins, sharks, sea lions, turtles, and marine iguanas. If you have an underwater housing for your camera this is the perfect opportunity. You will then return to the hotel for the night. This morning after breakfast, you will have a small hike (5km) to Muro de Las Lagrimas (Wall of Tears). 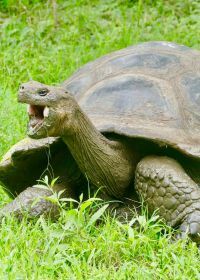 Along the walk we will find and photograph the wild giant tortoises of Isabela (Sierra Negra Giant Tortoises), as well as many other species found in the mangroves and beaches along the way. In the afternoon you will visit some of the world’s most stunning lava tunnels. As well this afternoon you will be able to snorkel alongside sharks and sea turtles. 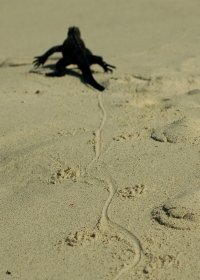 Or you can stay and find the baby iguanas and boobies. This morning you will leave the hotel and then travel to Baltra to catch your flight back across the Pacific and to Quito. On your arrival here you will be collected from the airport and taken to your accommodation for the night. After breakfast you will be transferred to the airport in time to catch your return flight home. Please note that the itinerary stated above is correct as our planned intentions for the tour. However adverse weather conditions and other local considerations can necessitate some modifications of the itinerary during the course of the tour; any changes will be made to make the best of the time and weather conditions available to us. This tour is available on different date (subject to availability) please contact us for more details about running this tour on a date which suits you more. The climate of Ecuador varies by region, due to differences in altitude and, to a degree, in proximity to the equator. The coastal lowlands in the western part of Ecuador are typically warm with temperatures in the region of 25°C (77°F). 10°C (50°F) at night. The average temperature annually is 17.8°C (64°F). There are only really two obvious seasons in the city: dry and wet. The dry season (summer) runs from June to September and the wet season (winter) is from October to May. As most of Ecuador is in the southern hemisphere, June to September is considered to be winter, and winter is generally the dry season in warm climates. Spring, summer, and fall are generally the “wet seasons” while winter is the dry (with the exception of the first month of fall being dry). The Ecuadorian Amazon is rainy, humid and warm! The rain becomes more frequent in March and continues through July. August thru early December is more of a “fluctuation season,” meaning that it can rain one minute and be sunny the next. This fluctuation makes it hard to classify this time of year as part of the rainy or less-rainy season. January is the start of the least rainy period, a period that continues on until March. Keep in mind that downpours and cool rainstorms can appear unexpectedly anytime of the year, so be prepared for your Amazon tour! When in the Galapagos the weather will be largely hot and dry. There can be rain any time of year, but in general the Galapagos is very dry and rain is often short lived. Everything mentioned in the itinerary is included. Including three meals per day (breakfast, lunch and dinner). There will be an amount of bottled water (approx 1ltr) available for each guest each day. We have our own private vehicle to be driven by a local guide for transfers when needed. 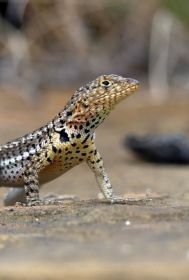 All our excursions including guided walks, vehicle safaris, animal captures, ex situ studios and park entrance fees are also included; we also include all fees for our expert herping and photography guides. When in the Galapagos Islands all of your boat transfers, snorkelling equipment, entrance fees, guided walks and guide fees are also included. We recommend you bring along your own binoculars or scope as well as appropriate clothing; which should be everything from swimming gear and warm weather clothing to warm cloths and waterproofs. The nights can be chilly so a fleece, long trousers and woolly hat are a good idea. Comfortable walking shoes are a must. Insect repellent is needed. Any medication, books or other items of a personal nature is of course up to you to bring along. Oh and please bring plenty of memory cards or film for your camera. Also do not forget sun cream, sun hat and sun glasses as the sun can be very strong here during the day. Please also bring along all of your own camera equipment including macro, wide angle and tele-photo lenses, tripod, ballhead, L-plate, external flash units, softboxes, plastic bags and silica gel to deal with lend fogging. In the Galapagos you are welcome to bring your own snorkelling equipment (mask, snorkel, fins and wetsuit), however you can rent a wetsuit from the boat and other equipment is included. We provide a comprehensive species list of all the vertebrates present in the areas we are visiting as well as some of the best field guides and reference books for the areas we are visiting. There is usually a spare pair of binoculars but in a group of 4-6 people these do not stretch too far. A spotlight is usually provided for nocturnal wildlife watching (when local conditions allow) and Camera Traps will also be used to try and capture hard to see wildlife in the dead of night. Snorkelling equipment such as mask, snorkel and fins are included. Wetsuit hire is extra, payable to the boat direct. Nearly everything is included in this tour. The only things not included are international flights, travel insurance (contact us for more information one what is required from your insurance policy), any food bought outside of the three main meals, drinks outside of any offered with the meals and the bottled water provided each day and any items of a personal nature such as souvenirs and tips. Any departure taxes applicable when leaving are not included (but may be included in the cost of your flights), Please check this before hand. If you choose to hire a wetsuit for snorkelling when in the Galapagos Islands this is extra. We recommend Continental Airline or Delta Air Lines Inc as good airlines for flights to Quito. One of the best websites to search for the best fares for all these flights is www.holidaygenie.com; who are ATOL bonded and IATA accredited this is a link direct to their site. Please check our terms and conditions regarding booking flights. Please contact us for more information about flights and we can provide you with a link direct to the flights from another supplier; in which case you only have to enter the passenger information and payment details. By using the above link you will leave our site and we at Royle Safaris hold no responsibility for the content on the site. All UK passport holders are not required to have a visa for Ecuador. However things change so the easiest way to find information is by visiting http://ecuador.embassyhomepage.com/ (be aware that these links leave our site and we at Royle Safaris hold no responsibility for information on the site). There are no mandatory vaccinations needed to visit Ecuador, but it is recommended to be protected against TB, polio, typhoid, tetanus and hepatitis It is however very important to be taking a form of malaria prophylactics during your time in Ecuador. Please consult your GP about your individual requirements for visiting Ecuador as soon as you have decided on this trip. 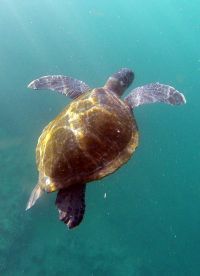 ...wildlife highlight was our encounter with the green anaconda, as well as swimming with so many turtles in the Galapagos...I suppose our non-wildlife highlight would have been the local guides we had with us throughout. We felt safe ad well taken care of all of the time.